A couple of days ago I had the chance to drive the new Range Rover, the latest edition of the gargantuan off-roader that squashes the earth into submission under two tonnes of aluminium, leather and luxury. Being decidedly more interested in cars that provide just enough rather than far too much, I instead borrowed the keys to the smallest 4x4 by far. 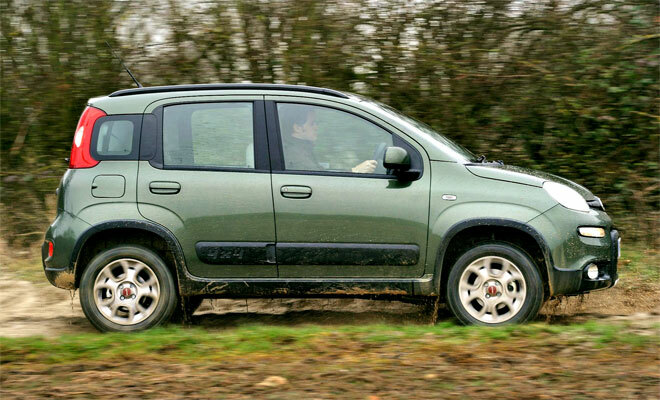 The humble Fiat Panda 4x4 is one of those products that manages to clamber over the normal rules of desirability. It isn’t fast or quiet or refined or luxurious and yet it still manages to seduce. I spent under an hour with the car and climbed out wanting more. Actually, I climbed out wanting to own one. Quite how the Panda achieves this level of mesmerisation isn’t clear when you sit in the upright chairs, peer around the limited confines of the interior or poke at the hard plastic dashboard. I shouldn’t like it as much as I do. Perhaps it’s the obsessive nature of the Panda’s design, which forces almost every element of the car into a squared-off circle. 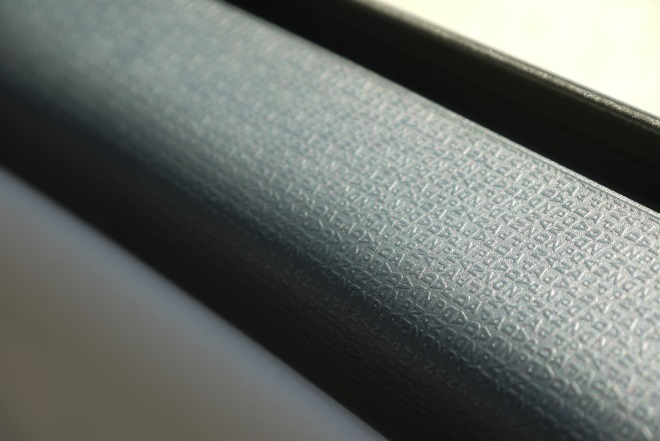 Maybe it’s the cute details like the tiny letters P, A, N and D embossed into the brittle plastic. 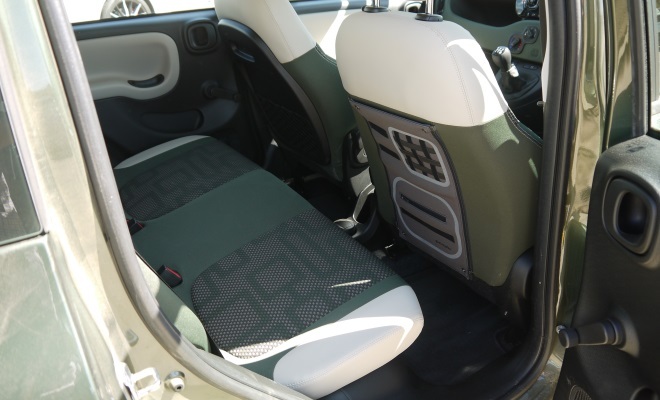 Or perhaps I just like the khaki interior because it reminds me of being a kid and staging battles between armies of plastic soldiers. What I am certain about is that this particular Panda is not playing at being a 4x4. This is the real deal (unlike the visually similar Panda Trekking, which isn’t). By rights, I should have tested the new Panda 4x4 back in January, but that particularly plan ended up buried under two feet of snow. It was ironic that weather conditions perfect for displaying the versatile Fiat’s talents prevented me getting anywhere near it. So I had to wait for warmer weather to get acquainted. 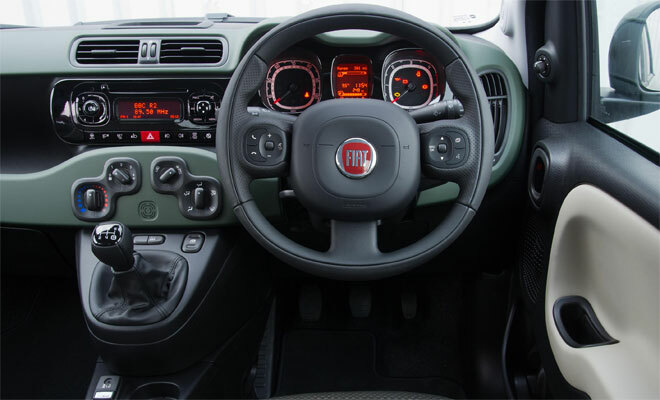 First glances reveal that Fiat has jacked up its little car – it has been raised by 5cm – and fitted 15-inch alloys shod with purposeful mud-and-snow tyres. Thick skid plates protect the Panda’s sensitive underbelly, while a propshaft and second differential can bring the rear axle into play whenever things get slippery. This is a permanent four-wheel-drive setup, although given sufficient grip only two percent of torque will reach the rear tyres – barely enough to ripple a rice pudding. But if the front wheels start rotating more rapidly than the rears, indicating a slippery surface, an electronically controlled hydraulic coupling can send as much as half the torque rearwards to make progress at both ends better balanced, providing improved traction the moment it’s needed. Similarly, differences in spin across the axles, between left and right tyres, are corrected by independently braking the speedier wheel, helping to send torque to the corners with the surest footing. It all works remarkably well. 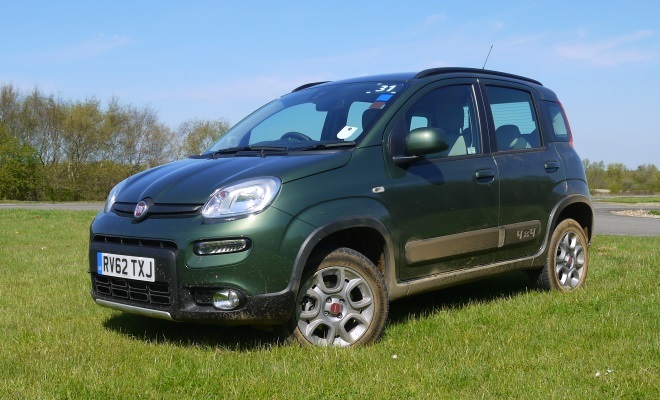 I drove the Panda 4x4 up some steep slopes of loosely packed sandy soil that really didn’t look negotiable from the bottom, from my vantage point in a five-door runabout not much bigger than a shoe. But the four-paw Panda climbs like it was orphaned as a baby and raised by mountain goats. Going downhill again feels equally weird and decidedly more scary. There are no fancy electronic hill-descent modes, though the braking system is smart enough not to lock the back wheels, which might turn a descent into a slide and my healthy fear of falling into an arm-flailing panic. Simply slot the stubby gear lever into first, inch over the precipice, keep feet well clear of the clutch and brake gently all the way to the bottom. And in my case, test the skid plate on the way down by smacking a section of extra-lumpy slope with a noise like a frying pan belted by a cricket bat. Back on solid ground I checked under the deck and couldn’t find a scratch, never mind a dent. Clearly the skid plate is made of stern stuff. And it was only at this point – somewhat late in the proceedings – that I noticed the unobtrusive little button ahead of the gear lever that locks the differentials. This is useful for keeping all four wheels turning in very slippery conditions. Pressing it might have been a wise idea prior to embarking on the steep bits. Venturing onto dry tarmac the Panda remained likeable, somewhat to my surprise. It offers a decent turn of speed and doesn’t feel anywhere near as top-heavy as it looks. It corners rather better than expected, probably because the onset of typical hatchback understeer brings rear drive into play, correcting the intended line and making the Panda a surprisingly agile little beast. It doesn’t lean too much either, despite suspension soft enough for running over big ruts. However, tyre roar, wind noise and engine boom all make themselves felt whenever speed builds on blacktop, so if you like to listen to anything more subtle than Motorhead on the stereo you may need to shop elsewhere. 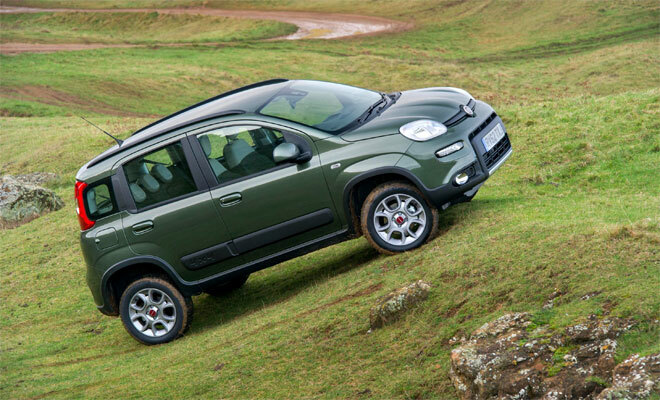 Two engines are available with the Panda 4x4. One is Fiat’s clever 875cc, two-cylinder TwinAir unit, a turbocharged petrol engine producing 85 horsepower and 145Nm of torque. 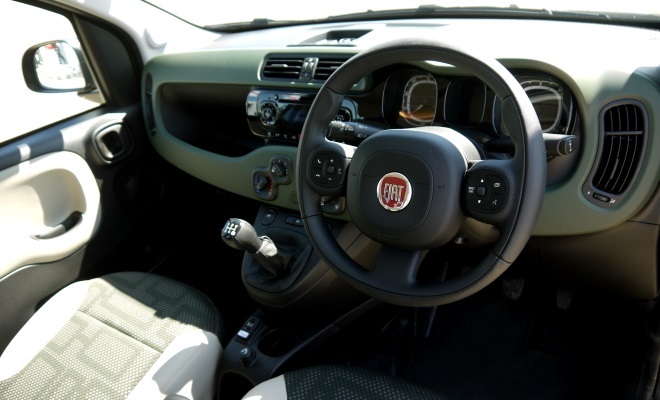 It comes paired with a six-speed manual gearbox featuring a low first gear biased for off-road use. The other engine option was the one fitted to my test car, a 1.3-litre diesel yielding 75hp and 190Nm. It makes do with five gears, utilising the engine’s low-down torque at slow speeds on soft ground. Both versions of the car weigh just over a tonne, with the diesel version 65kg heavier at 1,115kg. The sprint to 62mph takes 12.1 seconds in the petrol car and 14.5 in the diesel. Choose a TwinAir engine and prices start at £13,950, while the diesel edition is £1,000 more. 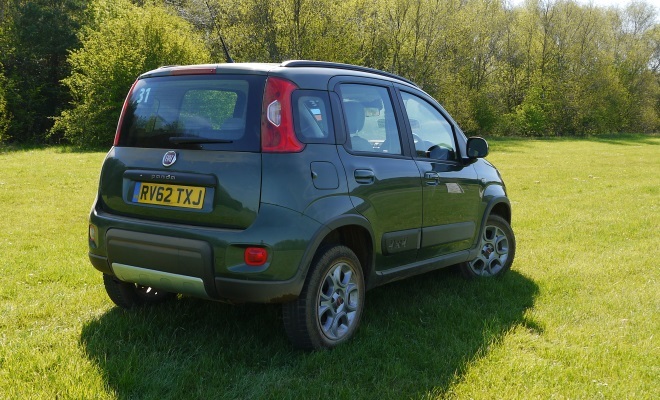 There’s only one 4x4 spec, offering a reasonable roster of equipment for what is a utilitarian vehicle based on a fairly spartan city car. In its official exams, the TwinAir edition manages a swotty 57.6mpg and 115g/km of CO2, while the diesel achieves 60.1mpg and 125g/km. I doubt either model will get anywhere near these results while chugging away off-road, of course. If I needed a car that could take me beyond the beaten track, this is the one I’d choose. And I’d be sorely tempted to own this car even if I never needed to stray off-road. After all, it snows from time to time, doesn’t it? Any excuse will do.